When I wrote my first book Creative Capital, I hoped that it would cross over into the mainstream AND appeal to the venture capital community. This week, I got some proof that VCs are finding value in the book. Brad Feld, a founding managing director of the Foundry Group, a venture capital firm in Boulder, Colorado that has invested in Zynga, StockTwits and Topspin, posted his list of the Best Books of 2009. And I am honored to report that Creative Capital made the list along with some very distinguished company, including great books by Dave Eggers and Andrew Ross Sorkin. This year, Feld read 72 books and he listed his top 5 non-fiction and top 5 fiction books. Thanks Brad!!! How Starbucks Saved My Life: A Son of Privilege Learns to Live Like Everyone Else: Successful Ad Exec finds himself in the dumps later in life. Fixed by a job at Starbucks. Too Big to Fail: The Inside Story of How Wall Street and Washington Fought to Save the Financial System—and Themselves: The Financial Crisis of 2008 unfolding in great detail. Shopping for Porcupine: A Life in Arctic Alaska: Actually, in really remote Alaska. 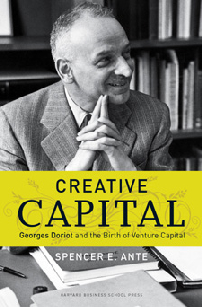 Creative Capital: Georges Doriot and the Birth of Venture Capital: The story of General Georges Doriot and the start of the venture capital industry. The Scorpion’s Gate and Breakpoint: Brilliant contemporary spy vs. spy stories by Richard A Clarke. Yes – I realize this is two books – read them in order. The Player of Games: An Ian Banks classic. Particularly interesting if you are addicted to Zynga games. The Orpheus Deception and The Echelon Vendetta and The Venetian Judgment: David Stone is my favorite new mental floss writer. Three books – read them in order. Daemon: Easily the best cyberthriller I’ve ever read. Supreme Courtship: Anything by Christopher Buckley always makes the list. Especially poignant given my Supreme Court visit this year. Check out this story I worked on with my colleague Stephen Baker. Twitter’s latest funding round values the microblogging site at $1 billion. Can the company become profitable enough—or profitable at all—to justify that valuation? True, a billion dollars for a company with virtually no revenue recalls the excesses of the dot-com era. The logic behind Twitter’s valuation comes straight from the very same school. It views Twitter less as a single company than as the base for a whole realm of communication and data. “It is an increasingly important platform for business and consumers,” says Seth Levine, managing director of Foundry Group. Did Anything Happen at CES? 2009 was going to be an off year at the Consumer Electronics Show no matter what. First, Microsoft founder Bill Gates, who gave the keynote speech for many years, ended his reign of CES keynotes. Second, the damn economy dashed a lot of people’s hopes for attending the show. I’ve never been to CES actually, and have never been a big fan of the show. But I always pay attention to what goes on, if for no other reason that it’s a good table setter that gets me thinking about the potentially big trends for the year. So did anything of consequence happen this year? Nothing earth shattering. But it seems like there were a few things of note, according to this blog post by the folks at Colorado venture capital firm The Foundry Group. Most of the action seemed to be centered around TV innovation. It’s nice to see that a 60-year-old technology still has legs. But 3D on TV? C’mon, people. It feels like the 1950s all over again when the industry gets excited about 3D. # Don’t buy a television for the next 6 months. This is certainly counter to what retailers and producers would want us to say, especially given the current state of the economy, but all the major brands are introducing exciting technologies in the first half of 2009. The TVs are thinner (some less than 1mm! ), brighter (LED backlighting rocks), faster (240mhz refresh rate) and offer superior contrast ratios (1,000,000 to 1 and even higher). Next to the best of today’s generation of panels, there is no comparison. Having been to CES a few years in a row, this year seemed to demonstrate the biggest improvements on imaging. If you don’t buy a TV in this generation, hold on a couple of years until OLED TVs are commonplace and then sit a back and look at the best displays we’ve ever seen. For now, we’ll geek out on LED backlit generation two screens. # Everyone is trying to make things easier on consumers. It only took 20 years or so, but consumer device manufactures, both large and small are finally focusing on the consumer experience. Maybe this is the effect of Apple’s entrance into the consumer device ecosystem, but this year, in particular, showed many instances of deep thinking about usability. What was of particular interest to us were some of the startups that attended the show and instead of presenting groundbreaking technology, rather have executed on current technologies to bring the consumer a needed digital solution with the ease of use never seen before at an unexpectedly low price. # 3D on TV. Full HD TVs and projectors that have incredible 3D-images (glasses needed) are now consumer available. Clearly the amount of content available will drive how popular these devices become, but the technology is really impressive to experience. We played a VW racing game in 3D and would have been happy to sit there all afternoon, or at least until the inevitable headaches set in. There was also a prototype of a 3D TV that didn’t require the viewer to wear glasses. It was pretty rough, but cool at the same time. We have our doubts that the entire universe of content will ever go 3D, given how different the production tools and processes are for live-action movies and television. However, for media like video games and CG animated content which are largely “3D native” already, there should be less of a hurdle to create appropriate 3D content, and probably better justification from a user-experience perspective as well.